This week the news arrived from Iran that an expedition of young Czech geologists discovered what might be the largest salt cave in the world. The discovery was no accident. It was one of the aims of the expedition which left for southern Iran a couple of weeks ago. In today's Czech Science we will find out more about the goals of Expedition Namak 2006. 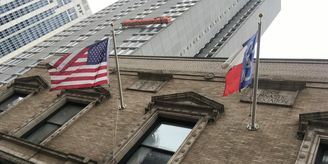 Photo: Project NAMAK In Farsi, the word "namak" means salt. Or Sodium Chloride, as ordinary kitchen salt is known among chemists. And it is salt, or namak, that Namakdan Mountain on Qeshm Island in the Persian Gulf is made of. Nine years ago the Czechs were the first to venture further into the caves than the entrance. They discovered a complex system of caverns and tunnels and have been returning ever since. "We were there in 1997 in the summer which was not a very clever idea because it is very hot there. The idea came from our professor Pavel Bosak who had worked there in 1990 and he found that in the area there were many large salt karsts and many caves and he could hardly find any information in the literature. 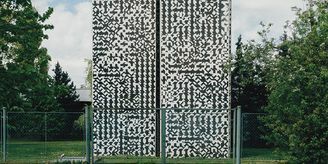 He was giving a lecture at Charles University and we realised that this could be a very interesting place, so we tried to visit it." Photo: Project NAMAK In those days Jiri Bruthans was still a student. Now he is a veteran of the expeditions, as well as another former student, Michal Filippi. Michal explains where the masses of salt in southern Iran came from. "In the Precambrian era, there was a large sea basin where massive layers of salt deposited. The sediments were covered by other types of rock, sandstone and limestone, and the salt layers got to great depths, up to ten kilometres. But salt is less dense than the other rocks and if subjected to great pressure can become plastic. Under certain condition it could begin rising and create large salt plugs which can squeeze through the rock and create salt mountains where after rain salt caves emerge." The Czech team are exploring the so-called "salt plugs" in Iran in collaboration with their colleagues from the University of Shiraz. 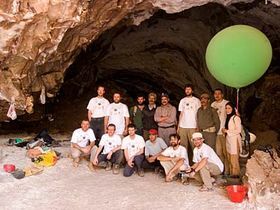 But it was the Czech students who were the first to explore and document several of the caves in southern Iran. They took countless photos and even shot a short documentary film a few years ago. This time the ten-member team includes a cameraman and a couple of photographers. Geologist Jiri Bruthans. Photo: Project NAMAK "For sure the entrance to the caves and the first 100 or 200 metres inside had been known for a very long time. 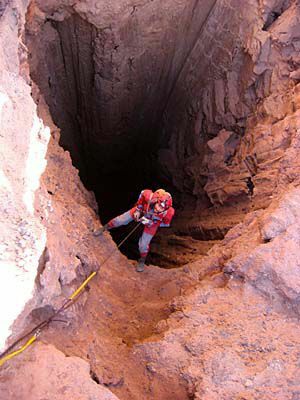 But to make a discovery of a cave means that you make a map, collect photographic documentation and so on. So we were the first people, in cooperation with the Iranian side, making these discoveries inside the caves, mapping the place, and so on." Now the Iranian caves bear names referring to the earliest student expeditions. "One of the caves is Ghar-e Daneshjoo which means The Students' Cave because the students were the main people who were carrying out the research in it. And the longest cave in the area now is Jeskyne Tri nahacu - which means The Cave of Three Naked Men. And it is because of the discovery." Photos from the salt caves show scenes of outstanding natural beauty. Underground lakes, dripstones and sparkling domes, not unlike limestone karsts. But, as Michal Filippi explains, there is a great difference in the speed at which these two types of caves develop. Photo: Project NAMAK "In limestone caves you can see signs saying don't touch the dripstones, they have been growing for thousands of years, whereas in the salt caves they grow for days or weeks after rain, when rainwater penetrates the rock, saturates it and in a month there are half-a-metre dripstones. We can practically watch them grow. Salt crystallises into cubes and beautiful cubic crystals emerge from the brine, unlike in the case of limestone where the sinter is shapeless. We can see beautifully shaped crystals which sparkle in the light." 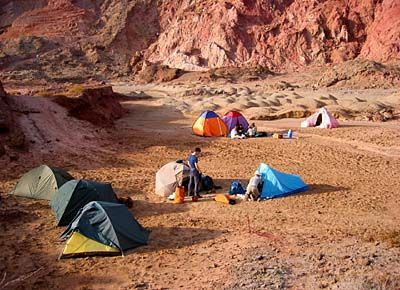 The saline solution in underground lakes is so saturated that members of the Czech expeditions have used sea water on Qeshm Island to wash their clothes, thick with salt crystals, and to cook. Drinking water is precious in the mountains of Qeshm Island and has to be brought in tanks. 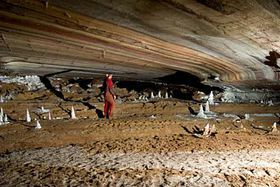 Photo: Project NAMAK Officially, the Cave of Three Naked Men (or Nudes, as it is sometimes called) is still only the second longest salt cave system in the world, after Israel's Malham cave. With the newly discovered passage connecting it to another cave called Velky ponor or The Deep Dive Cave, the Cave of Three Naked Men has most likely beaten the record. 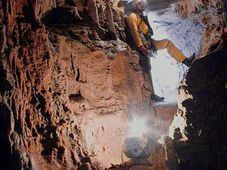 But proving that the Cave of Three Naked Men could be the longest salt cave in the world was just one of the aims of Expedition Namak 2006. "The main aim is to find out about the processes and the history of the development of the salt karst, the salt caves, to find out how old the cave systems are and also, we would like to try to find some new parts in the Cave of Three Naked Men. 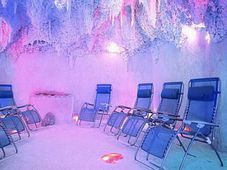 And we if we find several hundred metres more, it could be the largest salt cave in the world." ... said Jiri Bruthans before the expedition set off. 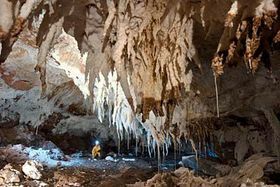 It now remains for the team to make thorough documentation of the new parts and submit it to the International Union of Speleology which will then decide whether the Cave of Three Naked Men will be recognised as the world's largest salt cave system.